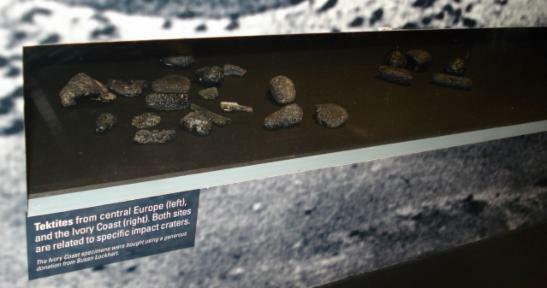 The tektites on display here are in the fifth photo with the big 'Meteorites' sign above them. 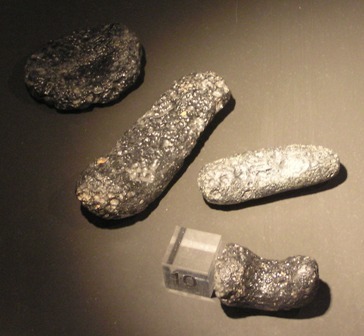 These tektites, located immediately outside of 'The Vault' in the Mineral Gallery, can also be seen below. They comprise five Ivory coast tektites on the right and dozen or so moldavites on the left. 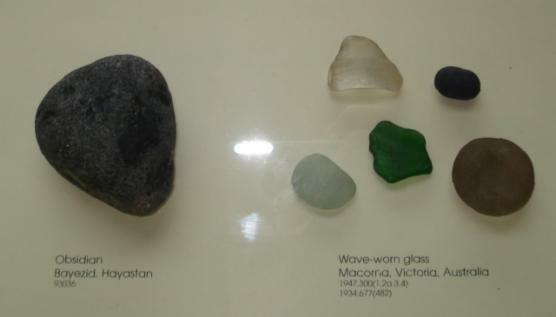 Another set of tektites (A few Indochinites and two pieces of Libyan Desert Glass) are found in the Red Zone in the glass display (Floor 1 I think). A broad-oval flanged button from between the rivers Darling and Murray, NSW, Australia was presented to Charles Darwin by Sir Thomas Mitchell. It could have been during Mitchell's visit to England in 1837 that he gave the Australite to Darwin. Mitchell may have found it on the sandy plains in 1835 or 1836. However, the WA Museum states that it was found in 1939. Charles Darwin wrote about the 'obsidian bomb' in 'Geological Observations...' in 1844. ABOVE: The Main display of tektites in the British Museum of Natural History, London. Moldavites on the left, Ivory Coast tektites on the right. ABOVE: Five fantastic Ivory Coast tektites. Ivory Coast tektites are exceedingly rare. ABOVE: A representative collection of average grade Moldavites. 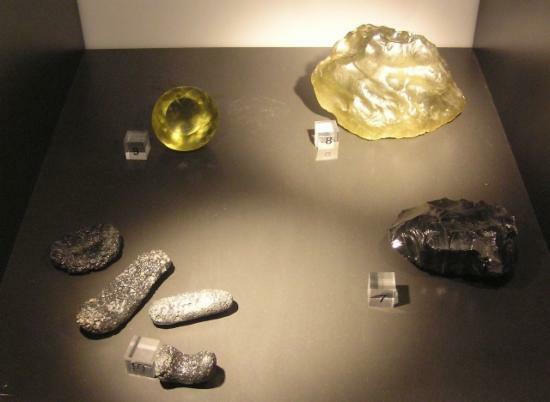 The find locality is uncertain as the tektite was found in drawer of Raffles Museum, Singapore. It may have come from Kelantan, Malaysia (Scrivenor, 1916) or Pahang, Malaysia (Beyer H. O. 1940) [Pahang is south of bordering Kelantan]. The 464g probable Malaysian tektite was broken whilst trying to cut it in half. The specimen was later presented to the British Museum of Natural History (Scrivenor, 1931). ABOVE: The natural glass display in the Red Zone. Number 7 is terrestrial obsidian. 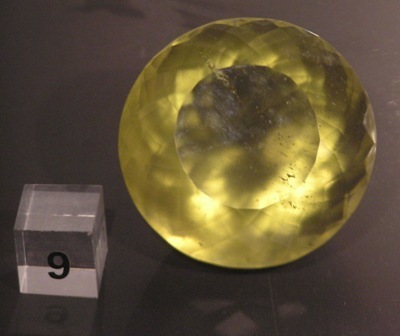 Number 8 is Libyan Desert glass. 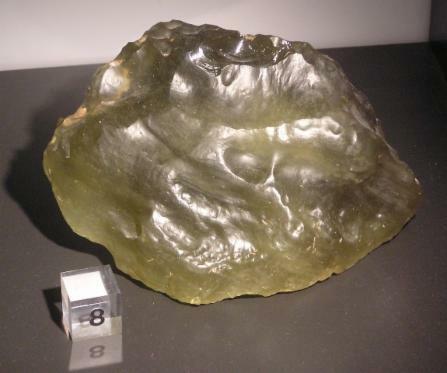 Number 9 is cut Libyan Desert Glass. Number 10 are tektites (Indochinites). ABOVE: Libyan Desert Glass in its natural wind-worn / sand-blasted state. Also note the nice conchoidal fracture at the top of the specimen. ABOVE: Cut Libyan Desert Glass. A fantastic specimen. ABOVE: Tektites. These are low-grade, but representative, Indochinites. The locality is not disclosed. Maybe these were collected by a prominent collector and have an interesting story behind them? ABOVE: Not tektites! Natural volcanic obsidian and man-made water-worn bottle glass. Useful for comparison. 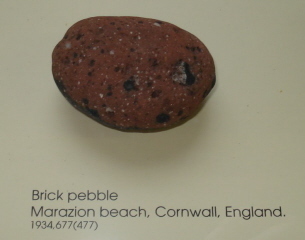 I'd love to see a Bikolite instead of this Brick pebble, but useful as comparison for beach finds!